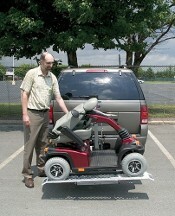 To improve the accessibility and transportability of a mobility vehicle, like the power chair or electric scooter, many people choose to use a wheelchair lift on their automobile. There are a good number of different types of vehicle wheelchair lifts, with the hitch mounted wheelchair lift consistently being one of the most popular options. The reason that hitch mounted wheelchair lifts are so popular is that they can be installed without any major modification to the automobile. There are models available for Class I, Class II, and Class III hitches, but to get the most weight support, a Class III hitch is required. Most hitch mounted wheelchair lifts use an electrical lifting system that is either attached to the vehicles battery or a rechargeable battery pack. Some can even charge your mobility scooter or wheelchair while on the road. Installing a hitch mounted wheelchair lift is as simple as sliding it onto the vehicles hitch. However, the wheelchair lift is a little bulky and hard to manage by one person, so it is a good idea to have a little help if you choose to install it in this manner. Another way to install a hitch mounted lift is to lay it on the ground and activate it. The first step is to move the wheelchair lift to the rear of the vehicle by the hitch. Line it up so that the hitch mount on the wheelchair lift is lined up with the vehicles hitch. It will still be a good deal lower, but you can eyeball the hitches location when it is on the ground. Once you have the wheelchair lift positioned properly, turn it on and press the down button, the same way you would do to lower the lift. This will cause the hitch mount to rise into the air, eventually becoming level with the vehicles hitch. It is then simply a matter of sliding the wheelchair lift onto the vehicles hitch. Some people do not even take the wheelchair lift completely out of its shipping box, instead only removing the top of the box. This can make sliding the wheelchair lift easier, without having to worry about scratching the wheelchair lift. A similar technique can be used when uninstalling the wheelchair lift. However, the wheelchair lift is actually powerful enough to cause the back end of the vehicle to raise, when the platform makes contact with the ground. If this happens, it will put too much pressure on the hitch for the wheelchair lift to be removed, so it is necessary to find the proper height of lift. Using a wheelchair lift can make it much easier to transport a wheelchair or mobility scooter. The hitch mounted lift is sometimes the first choice, because it offers one of the easiest and quickest solutions. However, it will store the scooter or wheelchair outside of the automobile, so using this type of lift does expose the scooter or wheelchair to the outside elements.